For instance, our greenhouse clients can obtain a 50% to 70% reduction in error in harvest forecasts from the start; following a year of further learning, the AI technology can reduce errors by more than 70%. Artificial intelligence (AI) is likely a familiar term, but how this technology can automate tasks and increase efficiencies in your greenhouses may be unclear. AI is a lot simpler than you might first think. AI is just sophisticated software. Using artificial intelligence, Motorleaf builds sophisticated software that can actually learn by finding patterns and associations in data--data is essentially ‘a lot of information’. Once the AI software learns the patterns, you can provide the AI new information and ask it, “what do you think will happen under these circumstances?” and the AI tool will offer a prediction with a high degree of accuracy. Machine learning is the type of AI technology we use to build our greenhouse automation services. There are no machines involved other than powerful computers--so no, there’s no robots automating greenhouse tasks in this case. Like the term states, our greenhouse technology does learn, and gets more and more accurate as we train the technology with your grow data following each harvest cycle. For instance, our greenhouse clients can obtain a 50% to 70% reduction in error in harvest forecasts from the start; following a year of further learning, the AI technology can reduce errors by more than 70%. The AI technology will also become more accurate in predicting harvest yields weeks into the future. Using big data from growing conditions, AI can predict the quantity of future harvests with unprecedented accuracy. These results show how a large-scale greenhouse cultivating tomato on the vine (TOV) was able to automate harvest forecasting, a task that previously required a day-and-half of work each week by a team of specialized farm workers. AI tools for greenhouses get better and better over time. That’s a wise investment. Why does AI solve problems with harvest forecasts for greenhouses? There are many factors that influence plant growth and the ripening of produce in your greenhouse. It is impossible for humans to analyze all these factors and know exactly how their plants will grow. AI makes analysis of all these growth factors possible and provides highly accurate assessments of plant growth. This is why AI works so well for making estimates of future harvests. Human abilities to predict future harvest yields often produce variable, imprecise results. 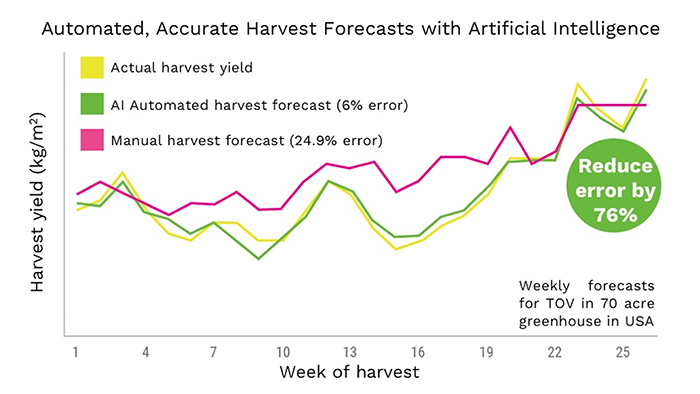 When continuously trained with more grow data from each harvest season, automated harvest forecasts enabled by AI can get progressively more accurate. 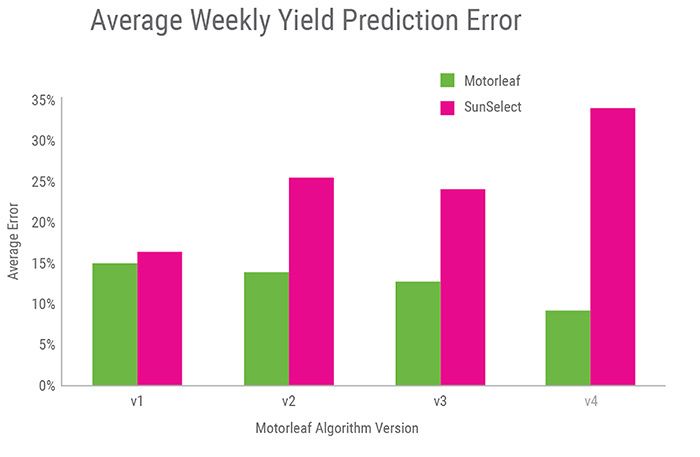 These results compare manual harvest forecasting with the AI automation service provided by Motorleaf following more than a year of use at SunSelect Produce. AI is better at estimating harvest yields than expert agronomists, enabling you to automate this task so your Head Growers and agronomists can focus their time on other important issues. On average, agronomists free up over a day of time they otherwise spent doing harvest forecasts. Best of all, our technology requires no radical changes to your business.